You may sign up for one introductory class on the GNPS calendar. The instructor, Sifu Tzyann Hsu, (tai chi master) brings more than two decades of working with older people in Park Slope to improve balance and leg strength and to engage mental focus through tai chi. The class size is very small to allow for individual attention and a class format which can adapt to individual challenges. If you have been curious about tai chi, this is a unique opportunity to see if it can work for you. 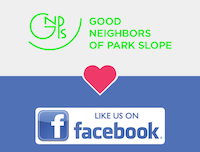 Good Neighbors of Park Slope does not promote, advertise or endorse other organizations or private businesses. However we do sometimes partner with local businesses who want to share their expertise or present information to our members. One free class per person. Please wear comfortable clothes. Please let us know if you are registered and unable to attend so that someone else can go. If you would like to attend and all spots are taken, please let us know and we can put your name on the wait list. Last minute cancellations or "no-shows" will not be allowed to register again for this free trial. If you cancel at the last minute or don't show up, you are preventing someone on the wait list from attending. If you cannot come you can request to be put on the wait list for another session.